Cooking has long been a passion of mine. From the early days of watching my dad create things from a variety of ingredients in our fridge to my culinary classes in college, cooking has always been something I love to do. I have spent my fair share of hours, and overtime hours, working in the food industry. I have watched cooks and Chefs prepare anything from a simple crudite platter to an Amuse Bouche of Mousse Foie Gras with a Cognac foam. I am not ashamed to admit it, I am a “foodie”….so it shouldn’t have come as a surprise to me when my love for cooking and my enthusiasm for helping people collided into a serendipitous explosion. Dollars for Dinners is a project I began about a month ago. I took an idea that began as a simple gesture for a friend last year and evolved it into a new way of getting real food into our local food bank. 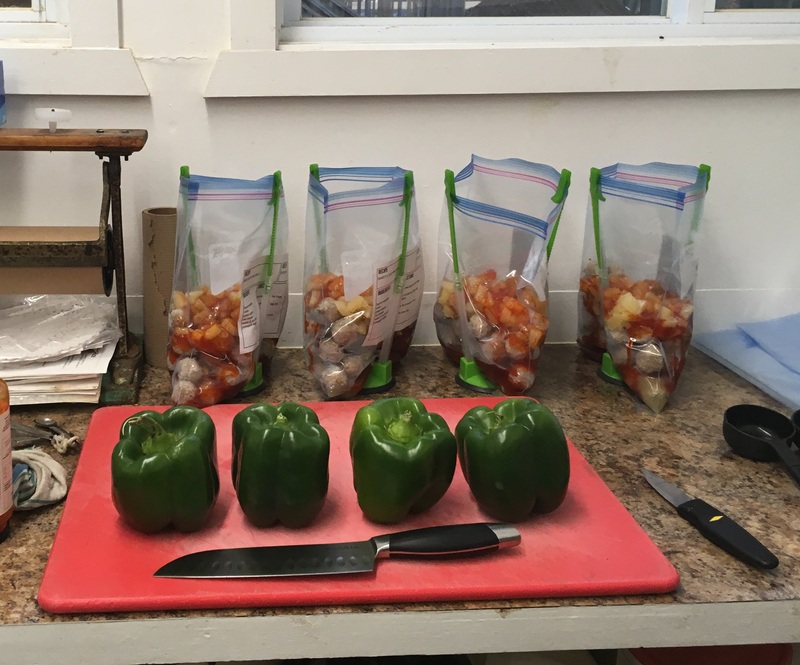 With the help of many friends and many donations, we are creating Freezer Crockpot meals that allow families to have a home-cooked meal once or twice a week made of REAL food and not just packaged, processed ingredients. Over the last week, some friends of mine have been sending this story to local media outlets. I have done live interviews with two radio stations, one of whom has done a food challenge to eat the food supplied by their local food bank for a week, sent my story to a third radio station and am in communication with a television station that may be interested in my project. The best part of all of this news and social media coverage is that I have a friend who has recently said that she is interested in doing this same thing in her community. This is the reaction I wanted. I want more communities to realize that this is a process that simply includes donations from its members and a few volunteer hours to make a huge difference to families in need. I am not looking for my fifteen minutes of fame…..I am merely looking to everyone to give fifteen minutes of their time to help Food Banks offer healthier and tastier options so families don’t have to survive on the things we only stock in case of the Apocalypse. You’re amazing. This is fantastic. I’m so impressed by what you’ve started! You’re a wonderful example of what one person can do and the difference it can make!